The Easybeats [a.k.a The Coca-Cola Special] (1966). Date: Unknown – filmed 15th June, 1968 at the Bratislava Song Festival. “The Easybeats got a fine reception and opened with “Friday On My Mind” but some spoil sport had their amplification down at the mains switch. For the first number we got a virtual drum solo from Tony and a belting vocal from Stevie. This was remedied by the group who realised they were being done and turned up their amps for “Good Times.” With all the guitars a-go-go it was a first rate sound. The excellent Czechoslovakian orchestra was brought in to augment the group under the direction of Norrie Paramor and we got first class renditions of “What In The World,” “Hello How Are You” and “Sha La La” which Stevie managed to turn into a singalong. To their credit they seemed to please not only the young but also the adults who kept their places for once.” – New Musical Express, 22nd June, 1968. Program: Unknown (Broadcast of the 2nd Yugoslav International Song Festival [1968 Spilt Festival]. Station: ARD Radio Bremen, Bremen, Deutschland. Songs performed: “Hello, How Are You”. Date: Unknown – filmed mid 1969. Program: Was ist Beat? – Keine Musiksendung! The Easybeats featured in a segment (7:50 mins to 13:00 mins) on the German TV music program Was ist Beat? (What Is Beat?). The clip was filmed during one of their shows on their final European Tour. Interview with the group during their Australian Tour at Caser’s Place Nightclub, Sydney. Date: Unknown – filmed 26th October, 1969. Survival Status: Unknown – Presumed wiped. A colour photograph from The Easybeats appearance at CBN-8 studios. 26th October 1969. Photograph taken by Newsreader Stephen Fleay (special thanks). See the Television Specials page for more details. Station: Hessischer Rundfunk Network (Channel Three), West Germany. Songs performed: “River Deep, Mountain High”, “Made My Bed, Gonna Lie In It”, “Lovin’ Machine/Batman/Lovin’ Machine (reprise)”, “Friday On My Mind”. Also appearing on the show: The Hollies, Carol Friday, Paul Jones, The Thoughts. Songs performed: “Friday On My Mind”. Program: The Don Lane Show. Songs performed: “Friday On My Mind” and “Heaven and Hell”. Station: WEWS-TV, Clevland, Ohio, USA. Also appearing on the show: Janis Ian, Stevie Wonder, Jon & Robin and the In Crowd, Smokey Robinson and the Miracles, and Gene Krupa. Before the tour, the group video taped two performances for broadcast on the syndicated U.S. music program Upbeat. This would be the group’s only US TV appearance ever. Introduced by host Don Webster as: “The Pride of Australia, singing their new hit single ‘Heaven’!” – the band lip-synced to the newly censored version of ‘Heaven and Hell’ and the current hit ‘Friday On My Mind’. The members of the group wore their matching black suits, except for Tony who wears a white t-shirt with a handkerchief. Stevie is so animated that the director gives up on close-ups and instead switches to long shots for the remainder of the performance. An appearance on an unnamed program was mention by Mike Vaughan in a interview for Trouser Press Magazine in 1976. “Garbage television. A guy in Philadelphia who got dressed up in a witch’s outfit. Nothing like “Bandstand” or “Upbeat”…”. – Mike Vaughan. Trouser Press. 1976. Notice: The Cool Ghoul gives away a copy of the Friday On My Mind LP at 2:30. Songs performed: “Friday On My Mind” and “Pretty Girl”. Very few of The Easybeats television appearances have been released to the public (or survived). Most footage that is circulating comes from their European TV performances. Month Unknown: Desmond Tester’s Channel 9 Pins. – TCN9, Sydney, Australia. Stevie performed ‘Dream Lover’. The first known Australian television appearance of a Easybeats member. Desmond Tester. Host of Channel 9 Pins. The bands first know television appearance. Photos of the group preforming on set were later used as the cover to their debut album Easy and on the She’s So Fine E.P. Survival Status: Believed to be wiped. Program: Go!! Show – ATV-0, Melbourne, Australia. Station: TEN-10 – Sydney, Australia. Also broadcast on CTC-7 in Canberra. Broadcast Date: 2nd November 1969 at 6.30pm EST. Show Taping: 21st October, 1969 at ATN-7’s Epping Studios. Songs Performed: Set-list unknown however one article confirms that “Hound Dog” was performed by The Easybeats. An advert printed in a October 1969 issue of the Sydney TV Week. 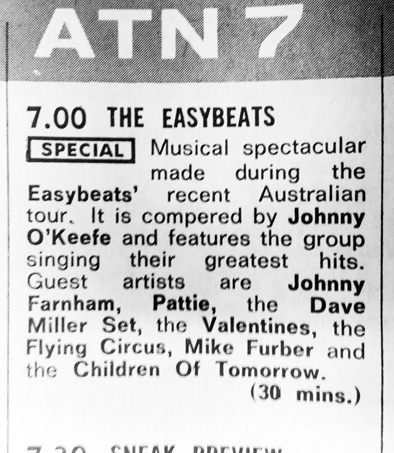 To promote the current Australian tour, The Easybeats recorded their second special for ATN-7. According to TV Week, taping for the show took place at ATN-7’s Epping Studios, after the group had returned from the Queensland leg of the tour. The taping session with the group took place in front of a studio audience. It began at 6.30pm and was scheduled to finish that evening at 9.30pm. The special was broadcast on Sunday night at 6.30pm (the Australian prime time slot then). Hosted by the “King of Aussie Rock ‘n’ Roll” Johnny O’ Keefe, the special included appearances from The Flying Circus, Johnny Farnham, The Valentines, The Dave Miller Set, Mike Furber, The Children of Tomorrow and “Little” Pattie. Stevie Wright. Photo taken from the special. A damning review about the long-hair’s in Veritas. Published in the Sydney Morning Herald. 9th Nov, 1969. The “reviewer” doesn’t so much critique the special on its own merits, but instead simply objects to having long-haired rockers on their TV at 6.30 on a Sunday. To date, no footage has surface as of the initial airing of the special. A picture in the Absolute Anthology LP liner notes is said to be a screen shot from the special. The photo has the band are both dressed and on a set very similar to the album cover of the Friends LP. Special thanks to Stephen Thomas for his research. The photo from The Easybeats special in 1969. As featured on the front cover of the Absolute Anthology album. The original special would have been a black and white broadcast. Another shot from the same photo session. This was used as the front cover to the Friends album. A bio of the group printed in the Sydney TV Week. Sydney TV Week listing for November 1969. Taping: July 1966 at the ATN-7 Studios in Sydney. Songs performed: “Wedding Ring”, “I’ll Make You Happy”, “I Can See”, “We’re Doing Fine” (performed by Janice Slater), “Sorry”, “Easy As Can Be”, “Someday, Somewhere”, “In My Book”, “Raining In My Heart (performed by Tony Worsley), “Knocking On Wood” (performed by Tony Worsley), “Come And See Her”, “Come And See Her” (Coke Jingle Version), “Women”, “Too Much”, “If You Don’t Think” (performed by Janice Slater), “Coke Jingle (Make Life Swing)”, “For My Woman”, “A Very Special Man”, “She’s So Fine”. If you every needed to show somebody the effect Easyfever had on mid 1960’s Australia, then you would only need to show them their Australian “farewell” television special. Although completely mimed, the bands energy is absolutely electrifying as the storm through their set list in front of a studio audience of screaming teenagers complete with go-go dancers and pop idol Billy Thorpe to compère. Special guests of the program included Janice Slater performing her then current release ‘We’re Doin’ Fine’ with it’s flip side ‘If You Don’t Think’ and Tony Worsley with ‘Raining in My Heart’ and ‘Knocking On Wood’ (released that month on Sunshine). Coca-Cola sponsored the program and the product placement is so blatant, that you would think it was satire. Thorpe holds a coke bottle facing camera while introducing the band. The Easybeats perform two “Coke Jingles” (the second with some awkwardly scripted opening banter from Stevie). It really shows the a unique period in rock history; there were no cries from fans of “selling out” it’s just what artists did. The closing credits show us the hysteria of the band boarding their QANTAS jet to the mother land. Next stop – London and Abbey Road Studios. Promotion for the special in TV Week, South Australia (Nov 19, 1966). Currently, the special is still unreleased in its entirety. The National Film and Sound Archive of Australia does have a 16mm kinescope of the program in its archive. This print has been used in various documentaries on the group and the performance of “Sorry” was used be Albert Productions as a promotional video. Filmed: 1967, various locations in the U.K. and Australia (1966). Survival Status: the complete original 16mm colour negative is believed to be destroyed. A 16mm Black and White copy partly survived. Two sequences were damaged during film processing. Some of the work print was rediscovered in 2009. This would be re-edited into a new 33 minute cut of the film. Songs performed: “Maybe It’s Because I’m an Easybeat”, “Heaven and Hell” (rehearsal, recording and finished song), “Wedding Ring”, “Loch Lomond”, “Who’ll Be The One”, “Saturday Night”, “Friday On My Mind”. Availability: Released on DVD in Australia – 2nd September 2015. 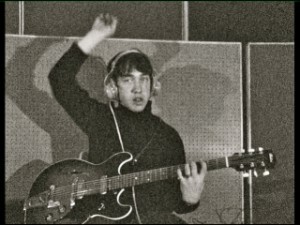 George Young during the “Heaven and Hell” sessions. Captured on the film Easy Come, Easy Go. With The Easybeats abroad, Australia’s national broadcaster, the Australian Broadcasting Corporation, commissioned a television documentary on the group which would be screened later that year. Young film-maker Peter Clifton was given the task of documenting the groups efforts in the mother country. The main focus of the film would be the writing and recording of the group’s next single – the mini-epic: ‘Heaven and Hell’. The footage captured is a fascinating look into the behind the scenes of the group in the recording studio mixed with various fantasy sequences and interviews married with Stevie Wright’s narration. Sadly the finished project was not to be and the film would be burdened with problems after it’s initial completion. The ABC took issue with the films original title: Between Heaven and Hell, so Clifton re-titled it after one of his favourite poems by Brian Patten; Somewhere Between Heaven and Woolworths. This didn’t fare with the ABC either as they felt that title was too close to the Woolworths company and in breach of their anti-advertisement policy. 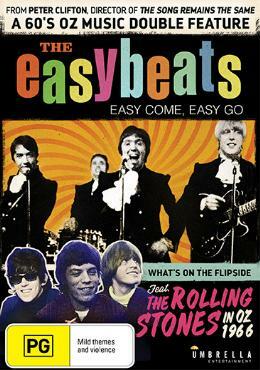 In the end, the ABC suggested the film be re-titled Easy Come Easy Go (in despite of an Elvis Presley film of the same title was released the same year). Clifton agreed with the change and sent the negatives back to Australia to be processed as Black and White print for Australian television. But fate would have its way – and a error in the lab would destroy two entire sequences of the 1 hour documentary, dramatically reducing its running time. The ABC were not impressed, nor at this stage enthused to screen a shorter feature so in the end they cancelled the entire project. The band performing “Saturday Night” in Easy Come, Easy Go. What remained of that black and white print, went missing very soon after. In 1969 Clifton would re-edit the colour footage of the band performing “Friday On Mind” with other scenes from the film, into a concert film In The Summertime…The Beat Goes On. This film road-showed across Australia until 1970. An unnamed Alberts employee has claimed that Easy Come, Easy Go was screened in the outer Sydney suburb of Wallacia in 1970, however it is more likely that it was the sequence from In The Summertime…The Beat Goes On. According to Clifton, his partner and producer Peter Ryan “threw out all the film components while I was in London and have never been found.”. Sequences from In The Summertime…The Beat Goes On were later reused in Clifton concert film Popcorn. The National Film and Sound Archive of Australia, where the 16mm print of the original 1967 version of Easy Come, Easy Go is kept, lists a 16mm colour film reel that goes for 3 minutes. At this stage, the content of that reel is unknown. 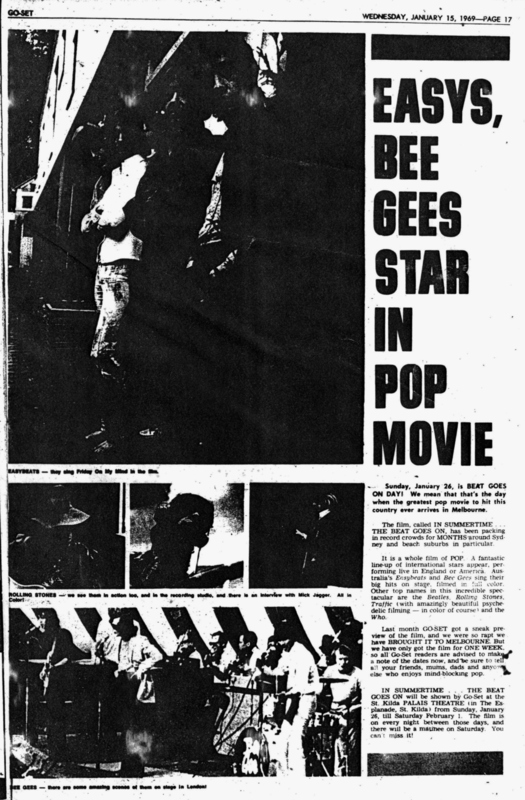 An article about In The Summertime… The Beat Goes On (1969). This early concert film by Peter Clifton feature the colour footage from Easy Come, Easy Go. Go-Set magazine. January 15, 1969. Click image to enlarge. For years the film was lost until, it was found by an act of chance. In September 2009, cult-movie distributors Oddball Film+Video held a screening of rare rock films in San Francisco titled:Friday on My Mind: Beat Group and British Invasion on Film. Part of the program was a 16mm print of the lost documentary. As luck would have it – around the same time author John Tait was researching his book on the Vanda and Young songwriting team (which would be released in 2010 as Vanda & Young: Inside Australia’s Hit Factory). 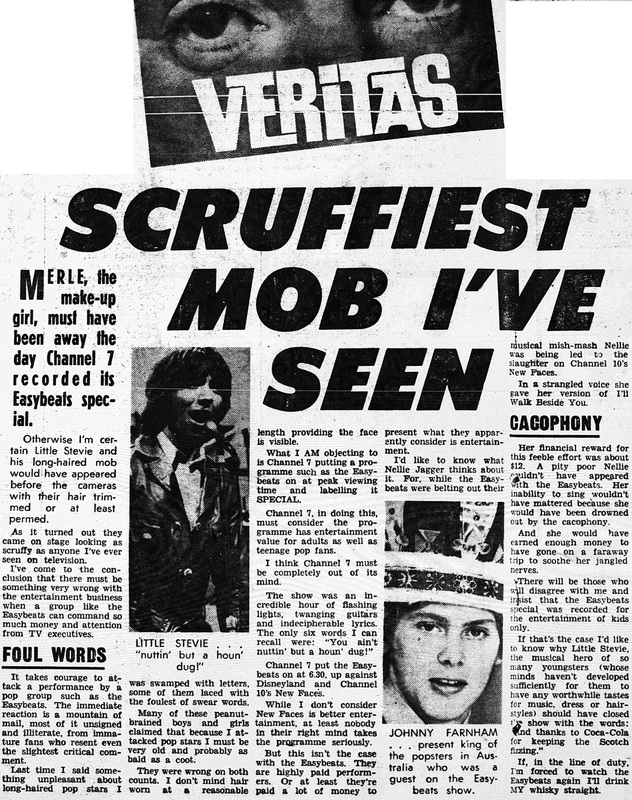 Tait’s research partner, Mike Griffiths, discovered the festival by coincidence, when researching information on Easybeats cover songs for Tait’s book. Oddball Film+Video’s festival came up in one of his Google searches. Knowing how valuable the film was, Griffiths contacted Peter Clifton and Oddball about retrieving the lost film. How the film made it to the U.S. is still remains a mystery. The 16mm print was returned to Clifton back in Australia for a restoration by the National Film and Sound Archive. The completed film (with the title Easy Come, Easy Go) was finally screened at the Sydney Film Festival in 2012. The film has made two other appearances since it’s 2012 screening. One at the St. Kilda Film Festival and the other with a performance of the bio-play Stevie: The Life and Music of Stevie Wright & The Easybeats. It was eventually released on DVD on 2nd September 2015 through Australian DVD label, Umbrella Entertainment (region free as well! ).